The artwork dominating the front page today of the Chicago Tribune wasn’t just weird. It was a badly executed knockoff of a clever graphc published a few days earlier in the New York Times. 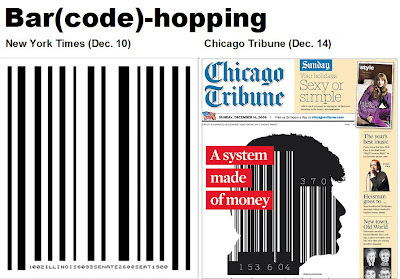 As you can see from the illustrations below, someone at the Trib superimposed a bar code over a profile of Gov. Rod Blagojevich for a story discussing political corruption in Illinois. As proven in the declining quality of each successive Indiana Jones movie, sequels rarely live up to the original. This was no exception to the rule. Hey, I resent your Indy remark. The third one wasn't that bad, IMO. I have to say the Tribune's graphic is better. That's what happens when you give radio executives the responsibility of running a newspaper. this reminds me of the similar Mad magazine/New Yorker bar code covers. Mad did it to throw off scanners across the country, and I think they alleged the New Yorker copied them. It seems that the Tribune staff may not be the heroes of the Blagojevich case, but the villains. Members of Fitzgerald’s team are livid the scheme didn’t advance, at least for a little longer, according to some people close to Fitzgerald’s office. Why? Because had the plot unfolded, they might have had an opportunity most feds can only dream of: A chance to catch the sale of a Senate seat on tape, including the sellers and the buyers. Designers do a lot of copying these days.